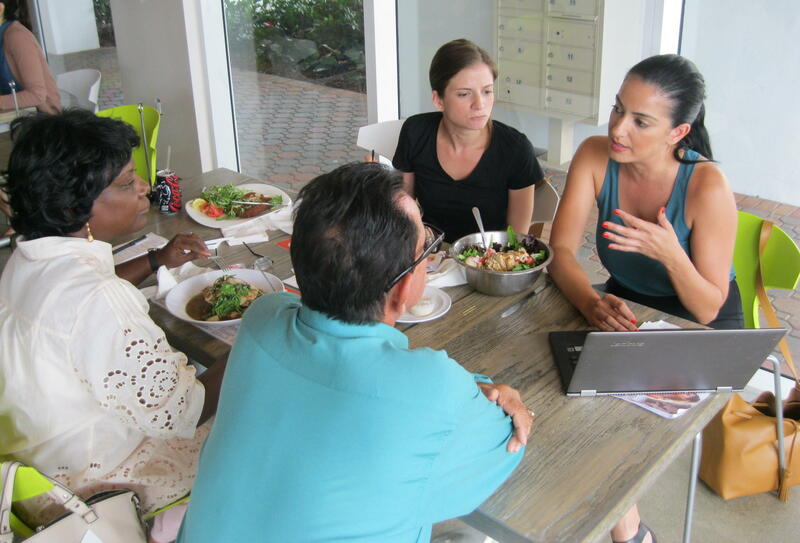 Miami swimwear entrepreneur Mel Valenzuela (right) explains online strategies to Cuban business owners Victor Rodriguez (middle) and Caridad Limonta (left) in Wynwood this month. Miami boutique owner Monica Minagorri (rear) watches. People in Havana use a free Wi-Fi network at a center run by artist Kcho on March 11. It's a small but unprecedented loosening of Cuba's strict Internet regulations by the government. Still, the vast majority of Cubans do not have Internet access. When Cuban bikini maker Victor Rodríguez visited Miami this month, he was on a pilgrimage — not just for bathing suits but for bandwidth. The most important stop on Rodríguez's schedule was lunch in Wynwood, Miami's high-tech district, with Mel Valenzuela, who owns the online swimwear store Pretty Beachy. As Valenzuela showed Rodríguez how to do business online, his awestruck expression seemed to evoke José Arcadio Buendía in One Hundred Years of Solitude, who when he first touches ice declares it "the great invention of our time." "My eyes light up," said Rodríguez, "when I see how greatly the Internet could expand my horizons as a business owner." The U.S. and Cuba are closer than ever to restoring diplomatic ties. But if you ask Cubans what they want most from normalized relations, they'll likely tell you they just want to get on the Web. Only 5 percent of Cuba's 11 million people have unrestricted access to the Internet, and only a quarter of them have any access at all. That's among the lowest levels in the world. It's also a human rights issue. Cuba's communist government says it wants half the population wired by the end of this decade. Yet it's reluctant to give Cubans such a powerful information tool. But here's the bottom line: Cuba can't rebuild its ragged economy if it doesn't build the Internet. And that's one big reason a growing number of fledgling private entrepreneurs like Rodríguez have been coming to Miami lately. They're looking in part for things like small-business advice, wholesale material, product trends and maybe even some investment and yanqui partnership. But perhaps most of all they want to touch the great invention of our time — "el servicio," as Rodríguez calls the Internet. "Being so limited is crazy," said Valenzuela. "Victor wants to do so much, and there's so much ambition, there's so much drive. And then at the same time there's so many things holding him back. So, like, what could take us a second to figure out, he's had to learn with whatever he finds." Rodríguez met Valenzuela through the Cuba Study Group, a Washington think tank that promotes U.S.-Cuba engagement. Valenzuela herself is a U.S.-born Cuban American who wants to connect with the birthplace of her parents — and in the process help Cuban business owners like Rodríguez learn how to operate online. With her laptop planted between plates of seafood salad, she offered a quick tutorial on basics like line sheets — pages that display your product line — and pricing information. Rodríguez is a former mathematics professor, and as he listened to Valenzuela you could see him calculating how to run with all of this. "Caramba, it would be worth every cent to find a photographer back in Havana who can take the high-resolution product photos I'd need," he said, thinking aloud. Valenzuela, meanwhile, checked out samples of the popular crocheted bikinis Victor brought from his shop in Cuba. And she began thinking aloud how well they might sell on Pretty Beachy's site. "They have what we're looking for, which is product," she said. "With the right Web designer and all of that, yeah, he could do partnerships here." But the big question is how soon — and to what extent — Cuba's red regime will give the green light. 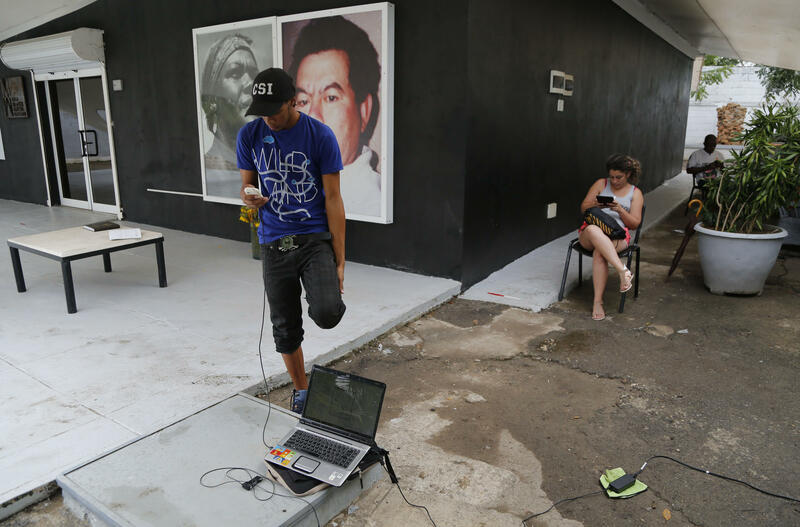 In recent months, the government has offered Cubans a few hours of free Internet in places like public plazas. And the most popular guy on the island right now might just be the Cuban artist named Kcho. With government approval, Kcho this year began offering Cubans free Wi-Fi — and unrestricted Internet access — at his Havana cultural center. They've been flocking to it like moths to a lantern. But for small-business folks like Caridad Limonta, another Cuban entrepreneur who joined Rodríguez and Valenzuela, the online frustrations — the inability to employ the Internet for everything from sales to supply chain to market research — are big and boiling. "Look," said Limonta, who owns a garment business called Procle, "to go online I usually have to travel to a hotel and pay $5 an hour," which is a quarter of the average Cuban's monthly salary. "I should be spending that time and money making my product." As their working lunch drew to a close, Valenzuela walked Rodríguez and Limonta through an online business transaction using their companies as examples. When she finished, Rodríguez stood up and enthusiastically shook her hand. "I just made my first online deal!" he shouted for all of Wynwood to hear. And as the man said, his eyes lit up. Copyright 2015 WLRN Public Radio. To see more, visit http://www.wlrn.org/.